I currently have a Proton MTB with a 24/34/44 crankset and a 14-28 cassette. I have found the configuration to be lacking when going downhill: The front chain ring doesn't feel stiff enough on the highest gear resulting in me pedaling too hard. On the MTB, running the highest gear, I am at an effective gear ratio of 44/14 = 3.14 while the Roam 3's config would give me 48/11 = 4.36. On paper, this is a 38% increase, but I am not experienced enough to know if this translates to a significant difference when pedaling. The other configuration I've mentioned is actually on another bike that I am considering buying (Giant Roam 3 2018). I am not looking to modify the current bike. 38% is a huge difference, and very noticeable on road. Since the bike you are considering has 622mm rims, it adds even more to the effective gear ratio. Meanwhile, at the bottom end, you wouldn’t be sacrificing your lowest gear by much and if you’re riding on the road you would have a gear for most hills (28x34 is lower than or comparable to most roadbikes). The main comparison I would suggest is that 48x11 on 38mm tyres is exactly the same ‘gain ratio’ as you would have on a road bike with 50x11 top gear and 23mm tyres. You’d just have a slight aerodynamic penalty on the flat bars, which actually benefits in the context of this question when you’re maxing out your cadence on the MTB. Weirdly. 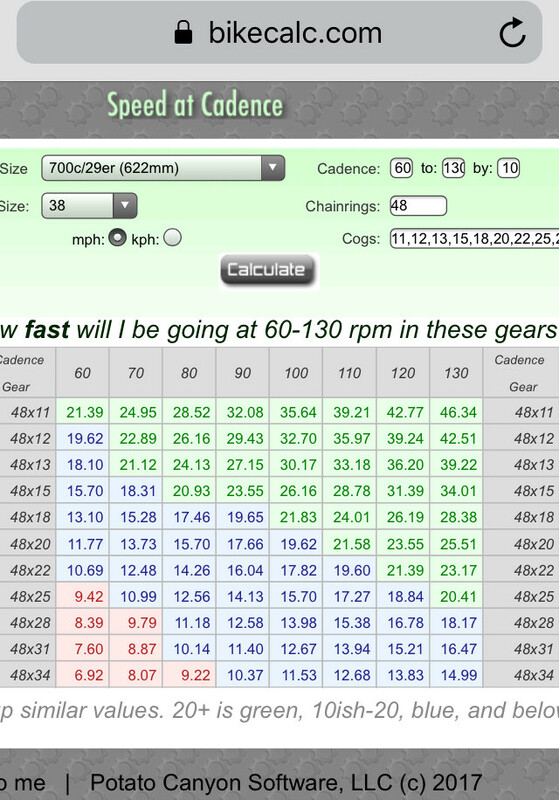 See this table from bikecalc.com - when pedalling at 100 rpm in 48x11 you would be travelling at 35 mph which is a good pace on any bike, especially if you can keep it up! Going from 44/14 = 3.14 48/11 = 4.36 is a big difference. On a given downhill your pedaling speed would 70% of that required with the lower gearing. You would not lose out on low ratios either: 24/28 = 0.86, 28/34 = 0.82. The trouble is, your rear derailleur probably cannot accommodate a 11-34 cassette. (Derailleurs have total capacity and max sprocket size specifications. Capacity is the difference between chainring sizes plus the difference between sprocket sizes - the wider range cassette requires 7 more teeth of capacity). Your chainstay may not have a may not have the clearance for the larger chainrings either. You don't say how many rear speeds you have but I'm guessing it's 6 or less if you have a 14-28 sprockets, and you probably actually have a freewheel rather than a freehub and cassette which limits your options. You may be able to squeeze a 12-28 freewheel in which would bring your highest ratio up a bit. Honestly, if you want better gear ratio options, you may just need to buy the better bike with a more modern drivetrain. Not the answer you're looking for? Browse other questions tagged gears crankset cassette or ask your own question. What is the widest range 9 speed cassette? (racer) Standard vs compact crankset: Increased leverage for same gear ratios true? My santa cruz heckler ghost shifts from frame flex. Is there anything I can do?